The title is inscribed in a spidery fashion at the very top with white chalk. It refers to the three females in Norse mythology who represent past, present and future. They are traditionally represented in a hall. 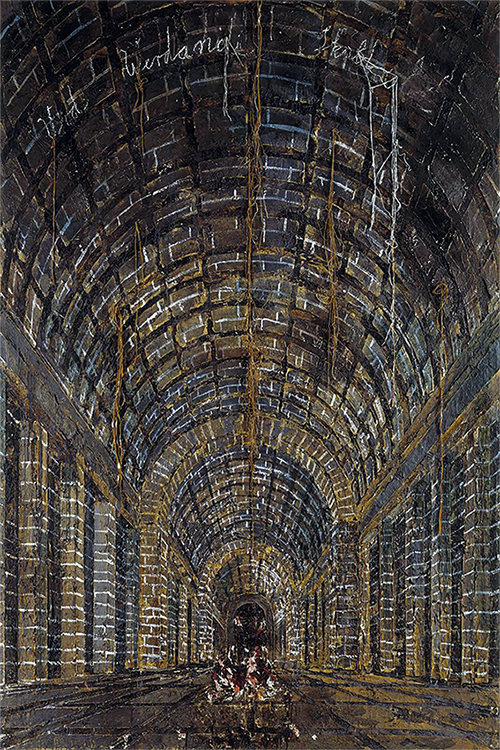 Kiefer’s paintings of this period were increasingly based on Nazi architecture. He used old photos and plans, morphing them into paintings of derelict, broken buildings. We see a long stretched-out passageway, pouring into a dark mysterious distance. This, on its own, leaves a lot to the imagination of the viewer. Where does it go? Where is it? What can be expected? I can imagine feeling as if there is a slow but intense dripping sound on a continuous repeat, never stopping. But, as you go further into the passageway, the dripping would get louder and louder and almost like a horror movie, you would be stuck in absolute despair. No sense of normality or feeling. Alone, so alone, trapped in this pit of darkness. The colours in the painting are essential to the taste that it brings, the way in which the painting is so refined but yet feels so lost and despairing and menacing. Many people don’t see the fire that is burning in the painting, even though it appears near the centre, seeming to float above the stacked paving stones, perfectly positioned in the eye’s focal point. The flames flow and spiral upwards as they dance towards the darkness beyond the fire. But looking closer at the fire itself, we see that the colours used there are also themselves dark, almost unnatural, as if the surrounding darkness has consumed the only warmth in the crumbled Nazi building.